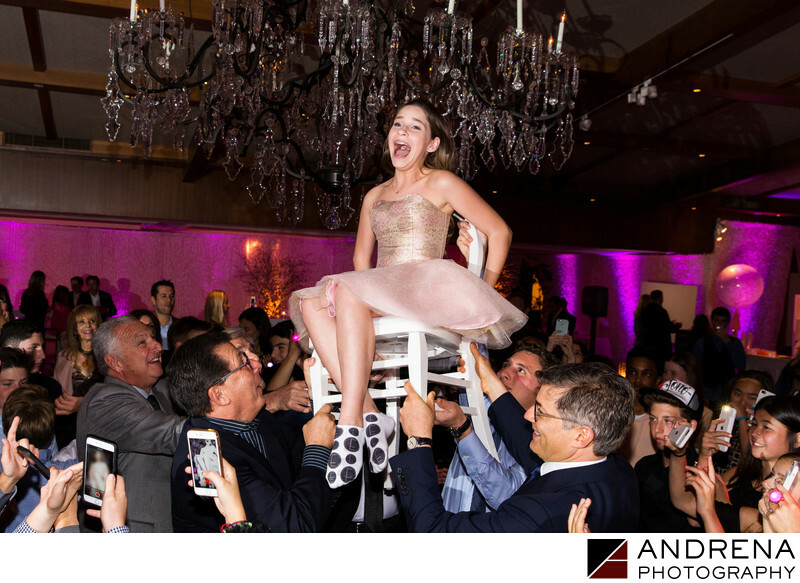 One of the most joyous moments of any Bat Mitzvah or Bar Mitzvah is when the crowd comes together for the hora, and the best photographers never miss that golden moment up on the chair. Having at least two photographers at different heights and vantage points in the party ballroom ensures that no matter how raucous the celebrating, and no matter which way the chair gets turned, your child's happiest expressions are always captured. This photograph simply screams fun! We see it in the thrilled expression on our Bat Mitzvah girl's face, in the proud expressions of the grown ups lifting her up, and in the smiles of all the kids truly having a blast. Creating photographs like this is not for timid photographers. We always get right into the mix to make sure we photograph this iconic Bat Mitzvah moment.